As mentioned in section 2.3, I estimated the area of each of the grids used for burning the bodies at Treblinka extermination camp at 66 m², assuming a length of 25 meters and a width of 2.625 meters. Mattogno & Graf’s estimate, also based on the grates’ description in the judgment at the 1st Düsseldorf Treblinka trial (Kurt Franz et al), is somewhat higher: 30 meters long by 3 meters wide = 90 m². The burning time of a pyre was calculated by Mattogno & Graf as the time required for the wood to be consumed by the fire, assuming a "sustainable value" for an open pyre of 80 kg per square meter per hour, and thus that 7,200 kg of wood could be burned under their 90 m² pyre in one hour. The corresponding amount for a 66 m² pyre would be 66x80 = 5,280 kg of wood per hour. Considering the amounts of wood per corpse shown in Tables 3.21 and 3.22 of section 3 (12.18 kg of dry wood or 23.14 kg of fresh wood), the average cremation times for 2,000 to 2,500 dead bodies would thus have been as shown in Table 4.1 below (which, like all tables in this blog, can be enlarged by clicking on it). The highest burning time shown in this table is 11 hours and corresponds to the burning of 2,500 bodies with fresh wood on a 66 m² grate. With a 90 m² grate, the time would be reduced to 8 hours. Using dry wood, the time required to burn the amount corresponding to 2,500 bodies would be 6 hours on a 66 m² grate and 4 hours on a 90 m² grate. Another way to estimate the burning time of a pyre is to look at the times required for mass burning of carcasses when more or less competently handled. A related online source contains information about the burning at High Bishopton Farm, Whithorn, Scotland, of 511 cattle, 90 sheep and 3 pigs over a period of three days on two separate pyres, each of which was 50 meters long and 1.5 meters wide. Assuming average carcass weights of 500 kg for cattle, 100 kg for pigs and 50 kg for sheep , the total weight of carcass mass burned was (511x500)+(90x50)+(3x100) = 260,300 kg. The area of the pyres was 2 x (50x1.5=) 75 m² = 150 m². Assuming a total cremation time of 72 hours, the carcass weight cremated per hour and square meter of pyre was 260,300÷(72x150) = 24.1 kg. At this rate a 66 m² pyre could burn 1,591 kg of carcass per hour, while 2,169 kg of carcass per hour could be burned on a 90 m² pyre. Similar times were achieved by Dr. Lothes & Dr. Profé in their carcass-burning experiments mentioned in section 3. In experiments IV to VI (carcass placed on inner pit below ground), the outer pit was 2 meters long and 2 meters wide, the inner pit 2 meters long and 1 meter wide. T-carriers two meters long were placed across the width of the inner pit, resting on that pit’s borders, which were 0.5 meters wide on each side. The grate area was thus 2x1 = 2 square meters. Regarding experiments I to III (carcass placed on pit above ground) the length and width is not mentioned in the article, but it can be assumed that the 2-meter T-carriers also used in these experiments rested on the pit’s borders in the same way as they did on the inner pit’s borders in experiments IV to VI (that is, lying above 0.5 m of ground on either side) and that the area of the pit containing the combustion material, and accordingly the area of the grate, was 2x1 = 2 square meters in these experiments as well. The times required to burn the respective carcass weights, and the carcass weights consumed per hour and square meter of grate, were as shown in Table 4.2 below. The average of 16.51 kg burned per hour and square meter of carcass in the experiments I to III is below the corresponding average of the Whithorn pyres, whereas the average of experiments IV to VI is somewhat higher, further proving the efficiency of a method that combines protection of the fire against wind on the one hand and good air circulation on the other. The higher average achieved in mass cremation at Whithorn, in comparison to the burning of single carcasses in Lothes & Profés experiments I to III, suggests that the average of Lothes & Profés most efficient experiments could have been exceeded in mass cremation. The following tables (4.3 to 4.5) calculate the number of hours required to burn 1,000, 2,000 and 2,500 corpses at Treblinka with an average weight of 18.95 kg per corpse (from Table 3.20 in section 3), pyre areas of 66 m² and 90 m² and the aforementioned per hour and square meter throughputs of 16.51, 24.1 and 40.12 kg. It is noteworthy that the burning time mentioned by Leleko (5 hours for 1,000 bodies) is feasible assuming a time-efficiency comparable to that of Lothes & Profé’s experiments IV to IV – a scenario that should not be ruled out considering the possibility that accelerants like gasoline made up much if not most of the external combustion material. Tables 4.6 and 4.7 show how long the burning of 789,000 corpses would take (considering the throughput, pyre area and corpse weight data from tables 4.3 to 4.5) with, respectively, 5 (Table 4.6) and 6 (Table 4.7) cremation grates of the sizes mentioned. The worst case scenario in these two tables (5 grates with 66 m² each, throughput as in Lothes & Profé’s less efficient experiments I-III) means about 114 days (24-hour periods) required for cremation only, leaving between (150-114=) 36 and (210-114=) 96 days for building the pyres and other preparatory work depending on whether one considers a total cremation period of 5 months = 150 days or 7 months = 210 days. Assuming a grate area of 90 m² as M&G do, the period for such preparatory work is extended to (150-84=) 66 or (210-84=) 126 days. Assuming a throughput as in the Whithorn pyres, time for preparatory work would be extended to (150-78=) 72 days or (210-78 =) 132 days with 66 m² grates and (150-57=) 93 days or (210-57=) 153 days with 90 m² grates. With a throughput as in Lothes & Profé’s more fuel-efficient experiments IV-VI, time for preparatory work would largely exceed burning time proper with any grate size. With 6 instead of 5 grates, the burning times would be accordingly shorter and the time available for preparatory work accordingly longer. One can thus conclude that the SS at Treblinka could master the task of burning about 789,000 corpses within 5 to 7 months, if only they implemented an efficient cremation procedure and properly organized the preparatory work. Mattogno & Graf claimed that "if the cremation of 860,000 bodies in Treblinka had been initiated at the beginning of April 1943, then under the most favorable conditions it would have ended in December 1945, and the Soviets as well as His Honor Judge Łukaszkiewicz would have been able to personally attend the performance!" Considering the above conclusions, this claim can – to use an expression of Mattogno & Graf’s – evoke only amusement. At Bełżec the corpses cremated within a period of about 5 months weighed about 23.65 kg on average (Table 3.18 in section 3), so the total corpse mass corresponding to ca. 435,000 corpses was 10,287,750 kg. Assuming the installed cremation capacity that was assumed for Treblinka in Table 4.6, one gets the burning times shown in Table 4.8. In the lowest average throughput scenario of Table 4.8, cremation would last between 58 (90 m² pyre) and 79 (66 m² pyre) complete days, leaving between 71 (66 m² pyre) and 92 (90 m² pyre) out of an assumed total cremation period of 150 days for preparatory work. The lowest installed capacity and throughput scenario (i.e. 3 pyres with an area of 66 m² with an average throughput of only 16.51 kg of corpse combusted per hour and square meter of grate) would mean 131 days of pure cremation time, leaving only 19 out of 150 days for preparatory work. In this scenario the cremation period would thus have had to be longer than 150 days, which would not be incompatible with the evidence insofar as at least one bystander witness mentioned cremation throughout the spring of 1943 and the stench of exhumed bodies was still noticed by another witness in April 1943, according to Reitlinger. In the other scenarios the time left for preparatory work ranges between (150-96=) 54 and (150-40=) 110 days. According to Bełżec SS-man Heinrich Gley (see section 2.1), each of the camp’s first one and then two fireplaces (Feuerstellen) could burn about 2,000 corpses within 24 hours, the burnings being carried out night and day without interruption during a period of 5 months. This number corresponds to throughput scenario c) in Table 4.4 (Lothes & Profé’s experiments IV-VI) with 90 m² of pyre area, assuming that out of 24 hours 14 were available for preparatory work and 10 were pure cremation time, or with a 66 m² pyre assuming 10 hours for preparation and 14 hours for cremation. It is not clear whether by fireplace (Feuerstelle) Gley meant a single pyre or a cremation site consisting of more than one pyre like there were at Whithorn and Treblinka. Testimonies of outsider witnesses mentioning 3 or an undetermined number of cremation grates at Bełżec point in the latter direction. 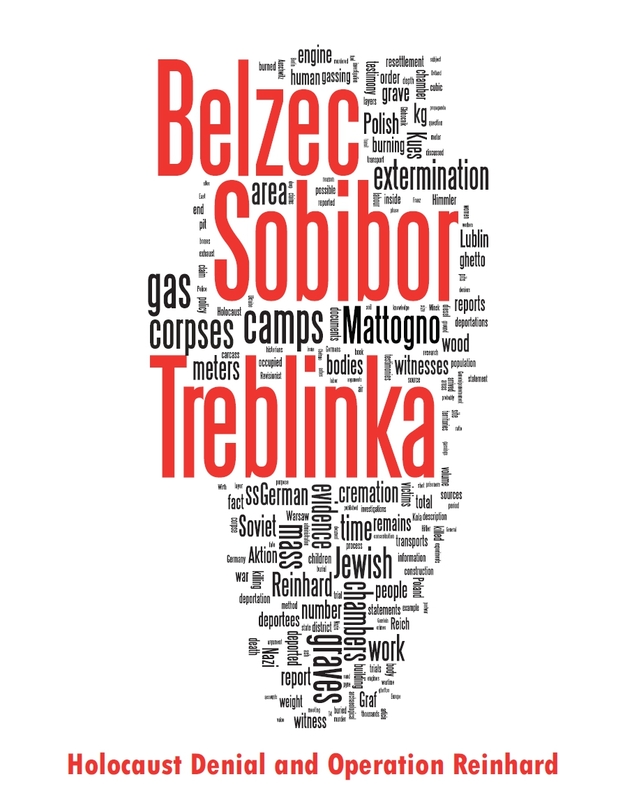 Sobibór extermination camp could afford to burn its about 170,000 corpses weighing 36.43 kg on average (Table 3.16 in section 3) at a more relaxed pace than Treblinka and Bełżec, as it operated for a year after having implemented cremation as its body disposal procedure in October 1942. As shown in Table 4.10 below, a single 66 m² pyre could have handled all corpses within 237 days at most (leaving 365-237 = 128 days for preparatory work), but possibly within as few as 97 days (time left for preparatory work = 268 days). With a 90 m² pyre, cremation would have lasted 174 days at most (leaving 191 days for preparatory work), but possibly as little as 71 days (time left for preparatory work = 294 days). Grave No. 7 (?) is a site where corpses were burnt, with an area of at least 10 × 3m and a depth of up to 0.90 m, located in the central part of hectare XVIII, approx. 10 – 12 m to the south from the southern edge of grave No. 4. The deposits of cremated corpse remains appeared in 6 boreholes during drilling. There are soil transformations around the grave of unknown origins. The structure was classified as a grave only because of the cremated corpse remains. However, it is possible that it was just a place where corpses were burnt. In order to determine the function of the place accurately, more detailed excavations are required. The above text shows that Prof. Kola considered it possible (but not certain) that this "grave" was "just a place where corpses were burned". Not the (only) place where corpses were burned, but a "place where corpses were burned", i.e. one out of several burning sites. MGK conveniently transformed this into a categorical statement that grave # 7 was the (only) cremation site at Sobibór. To make matters worse, MGK also ignored the fact that Prof. Kola considered each of graves nos. 1 and 2 to have been body-burning graves, obviously on account of having found only cremation remains but no whole corpses or larger unburned remains in these pits. The available English translations of Prof. Kola’s descriptions of these graves by MGK and by Katarzyna Piotrowska don’t differ significantly except as concerns the last paragraph of each grave’s description, which reads "It contains the remains of burned corpses" according to MGK and "It was a body burning grave" according to my translator. The original Polish term in the article is "Grób cialopalny". "Grób" means "grave" and "cialopalny" obviously refers to a property of the grave, so it doesn’t look like my translator made a mistake here. MGK, on the other hand, translated the term "Grób cialopalny" as "It contains remains of cremated corpses". This translation, while accurately rendering what the original text says about the contents of the grave (remains of cremated corpses), obfuscates Prof. Kola’s assessment of what the grave’s purpose had been, which the translation "body burning grave" conveys. Prof. Kola obviously assumed that, as graves nos. 1 and 2 contained only cremation remains, they had never been used for burying whole corpses but only for burning corpses whose cremation remains had then been buried in them. One cannot help the suspicion that MGK mistranslated this passage in order to conceal from their readers the fact that the archaeologist had located two other cremation sites besides grave no. 7, which belies their claim that grave no. 7 was the "only incineration site identified for Sobibór". MGK’s mistranslation is all the more understandable – from the point of view of their agenda – considering the surface areas of these graves: 400 m² for grave no. 1, 500 m² for grave no. 2. Even assuming that (as described in the Judgment LG Hagen vom 20.12.1966, 11 Ks 1/64, see section 2.2) the cremation grid was placed inside the pit (possibly across a smaller pit dug at the bottom of a bigger pit, like in experiments IV to VI by Dr. Lothes & Dr. Profé) and that the pit’s bottom area was smaller than its surface area, it seems reasonable to consider that the two pits, with a combined surface area of 900 m² (or the single huge pit they originally constituted, see section 2.2), could accommodate a pyre area at least half the surface area, i.e. 450 m². So large an area would not have been required to cope with an average daily number of ca. (170,000÷365 =) 466 cremated corpses. However, there is evidence suggesting that cremation capacity at Sobibór was high enough to cope with peak loads more than 10 times higher. A Polish witness by the name of Piwonski, living in the village of Zlobek three kilometers to the north-west of the camp, was told by some of the Ukrainian guards that one day as many as 5,000 to 6,000 bodies were disinterred at Sobibór, obviously in order to be burned. 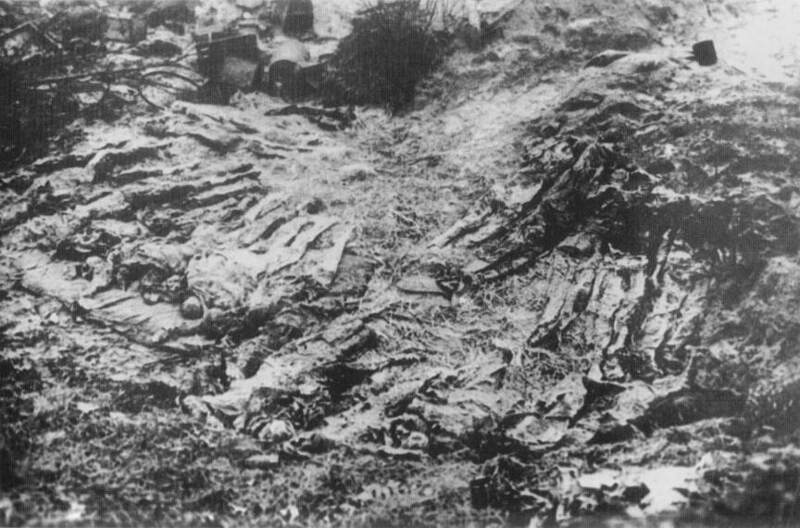 Piwonski’s mention of disinterred corpses calls for assuming that the cremation performance suggested by his Ukrainian interlocutors was achieved with decomposed corpses of deportees killed and buried during the first phase of the camp’s operation, until the end of July/early August 1942. The average weight of these deportees (Table 3.16, categories "A" and "B") was (1,968,046 ÷ 80,000) = 24.60 kg. With this average weight the times required to burn 6,000 corpses, assuming the same pyre areas as in Table 4.6, would have been as shown in Table 4.11 below. Understandably uncomfortable with the idea of efficiently burning corpse pyres, MGK claim that "in mainstream Holocaust historiography the descriptions of the fires provided above speak of smoke and dust as phenomena which normally accompanied the incinerations, but this only goes to show, as we have already noted, that the combustion proceeded poorly. First of all, the descriptions provided "above" don’t necessarily bear out MGK’s reading, for they mostly mention flames that were widely visible, especially at night, rather than smoke and dust. Second, smoke and dust do not necessarily indicate poor combustion but may also be due to the use of certain materials for burning, for instance tar. Dr. Lothes and Dr. Profé observed in their experiments that the smoke developed was considerable only as long as the tar was burning, their article further mentioning that stronger development of smoke was found to take place only at the start of the burning process. Even MGK would hardly argue that combustion proceeded "poorly" in the experiments of Dr. Lothes & Dr. Profé. Another of MGK’s claims is that, while fresh corpses could be arranged on the grate in a somewhat orderly fashion allowing for open spaces to be provided for the passage of air, the unearthed corpses were simply dumped from the excavator in vague piles of shapeless mass. 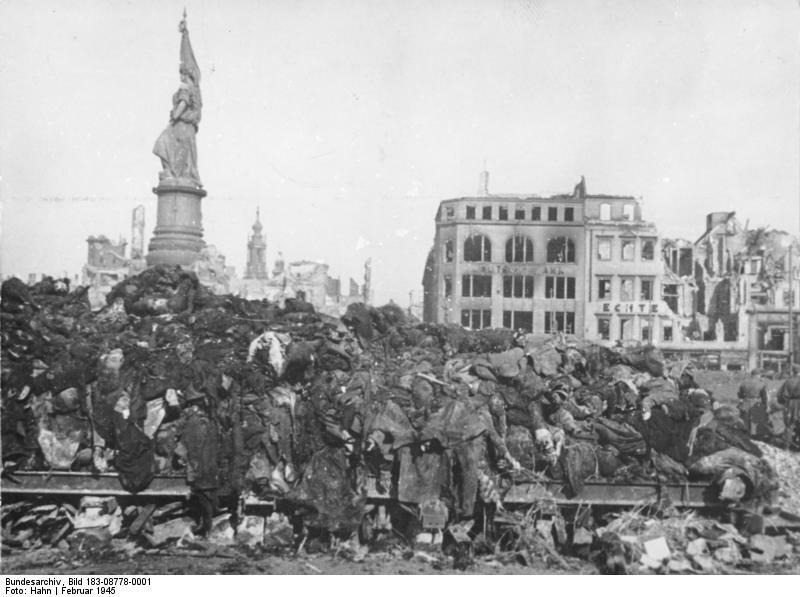 To be sure, arranging decomposed bodies on the grid must have been more unpleasant than doing so with bodies of freshly killed people, but there’s no reason why the prisoner-workers couldn’t have arranged them in a fashion at least as "orderly" as victims of the Dresden air attack on the pyre at the Altmarkt (see Image 3.2 in section 3), whose cremation doesn’t seem to have been hampered by insufficient air circulation. The fragility of such bodies, which were likely to become separated into several pieces in the hands of their handlers, might even have helped a cremation-friendly arrangement. See the blog Mattogno, Graf & Kues on the Aktion Reinhard(t) Mass Graves (3), where the average height of an adult Polish ghetto Jew was calculated as being about 1.60 meters. According to the R&D Ergonomics webpage, the width of people with narrow shoulders, weighing less than 100 lbs (45.3 kg, more than the average weight of a malnourished adult Polish ghetto Jews that I considered), is less than 16 inches (0.41 meters). M&G, Treblinka, p. 147: "If one takes into consideration the fact that 3,000 bodies take up a volume of about (3,000×0.045 =) 135 m3, the claim, according to which the shovel of the excavator could be loaded with 3,000 bodies at a time, will evoke only amusement." Bay, Treblinka, Appendix D - Ash Disposal and Burial Pits (Continued). Photographs such as the one shown as Image 3.2 in section 3 and on the website of the Deutsches Historisches Museum (Verbrennung von Leichen in Dresden nach der Bombardierung) suggest that the height of the corpse pile above the grid was 2 to 3 meters. The volume of the pile of bodies was thus between (66÷4x2=) 33 and (90÷5x3 =) 54 cubic meters, meaning that the 500 bodies in each pyre were piled up at a concentration of 9 to 15 bodies per cubic meter. Survivor witness Oskar Strawczynski mentions the presence of three excavators, which "growled away from 4 o'clock in the morning until nightfall" over a period of "many months" (Strawczynski, Escaping Hell, page 169). His information as concerns the number of excavators corroborates and is corroborated by Alex Bay's analysis of the excavator photographs taken by the extermination camp’s deputy commandant Kurt Franz (Bay, Treblinka, Reconstruction of the Death Camp (Continued)). Based on air and ground photo analysis, Bay managed to establish the places inside Treblinka extermination camp at which some of Franz’s excavator photos were taken (Bay, Treblinka, Figures 36, 37, 38, 43, D2 to D8), which hinders the claim that Franz went to photograph excavators at the gravel quarry by the Treblinka I labor camp in his free time – the only argument "Revisionists" have regarding these excavator photos, as the use of excavators is incompatible with a mere transit camp. See notes 35 and 41. Arad, Reinhard pp. 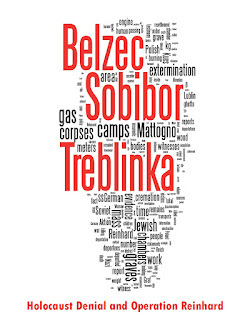 175 f.
 Jankiel Wiernik: "A Year in Treblinka", in: Donat, Treblinka, pp. 147-188, here p. 171. Mattogno & Graf (Treblinka, p. 147) ignored the quoted passage and referred to a plan of the camp drawn by Wiernik that was presented at "the trial in Düsseldorf", to claim that there were just two cremation facilities because two are drawn on said plan. The plan, shown as Document 5 on page 319 of M&G’s book, is a sketch not drawn to scale that contains two symbols representing cremation grids, which are obviously meant to give a rough idea of the location of the grids rather than make a statement as to their number. It was also understood in this sense by the judges at the first Düsseldorf Treblinka trial, who in the judgment (as mentioned in section 2.3) stated that the number of cremation roasters could not be established exactly in the main proceedings. M&G omit the respective passage from the judgment, even though it is at the end of the paragraph containing the description of the grids, which they quote on page 147 of their book. M&G, Treblinka, p. 149. The same calculation was presented in Mattogno, Bełżec, p. 86. It is not clearly stated in the source mentioned in note 171 whether the set of pyres burned for three continuous days or whether several incinerations were carried out over a period of three days, as in the swine carcass burning experiment at Pilot Point, Texas in 1994 (see note 67). An indication in the latter direction is the mention on page 6 of the Whithorn report that on the third day of the pyre (50 hours after commencement) cattle mats were added, whereas descriptions of the plume monitoring process suggest continuously burning pyres. Assuming the latter, it is possible that not all carcasses were on the pyre at the time it was lit but some were added later in the manner suggested by photos in the BBC articles under Costly memories of foot-and-mouth, Pollution fears of animal pyres and Water warning over burial sites and in the Sun article Devastation of 2001 outbreak. In this context it should also be borne in mind that cremation at Treblinka did not necessarily reduce the corpses to ashes like the carcasses on the Whithorn pyres or in the experiments of Lothes & Profé (section 2.3). Eustachy Ukraiński, see note 6. See note 9. Reitlinger also writes that working inmates were "occupied in effacing the mass graves" until June 1943. MGK, Sobibór, p. 145: "According to the official Holocaust historiography, the cremation of the corpses was carried out in a trench, on grates made of railway rails which rested on blocks of concrete. This trench, A. Kola informs us, measured 10 × 3 meters and was 90 centimeters deep." P. 146: "However, the only incineration site identified for Sobibór (cf. above) covered a surface area of 30 square meters and was 90 centimeters deep." MGK, Sobibór, p. 118 f.
 As mentioned in section 2.2 and in the blog Mattogno, Graf & Kues on the Aktion Reinhard(t) Mass Graves (1) (section 2.2, note 26), Prof. Kola’s finds corroborate related witness testimonies. Deposition of Jan Piwonski in Lublin on 29.04.1975, as note 25. On pp. 141 of their Sobibór book, MGK quote an excerpt from the judgment LG Hagen vom 20.12.1966, 11 Ks 1/64, including a passage whereby the light from the fires was visible inside and outside the camp. On page 142 they quote an excerpt from Schelvis 2007 mentioning that the mass cremations "resulted in huge fires, which flared up so high they could be seen far and wide, especially at night", that the Ukrainians in their watchtowers "could see the flames whenever the wind blew in their direction" and that the flames "were visible even from Piwonski’s house in the village of Zlobek three kilometres to the north-west". Judge Zdzisław Łukaszkiewicz is quoted on the same page with the following description: "The burning of the corpses was, however, difficult to hide, as the wind would spread a specific smell of fire all around and because the smoke and the fire from the burn sites were visible from far away." This is the only mention of smoke from mainstream Holocaust historiography "provided above" by MGK. Lothes & Profé (as note 81). Smoke can often be seen rising from carcass pyres, e.g. on the photos in the BBC articles Dioxins: What are they? and Focus back on foot-and-mouth pyres. Were those pyres combusting poorly? MGK, Sobibór, pp. 147 f.
See for instance Schelvis 2007, p. 111: "The operator would drive right up to the grid, where the Arbeitshäftlinge from Lager 3 piled the bodies into human pyramids. Then they were burnt." At Treblinka the procedure was the following (Arad, Reinhard, p. 176): "The shovel’s scoop removed six to eight corpses with each dip and dumped them on the edge of the pit. A special team of prisoners, working in twos, transferred the corpses to the crematorium on stretchers." See, for instance, the following photos included in the blog Photographic documentation of Nazi crimes: 1.2.27, 1.2.28, 1.4.2, 1.4.3, 2.3.20, 2.3.21, 2.3.22, 2.3.23, 2.5.2, 2.5.6. Further to Footnote 175, Rajchman's memoir states that an "ash commando" was formed at Treblinka in Feb 1943 because the cremation often left behind body parts that "often kept their shape" ("The Last Jew of Treblinka", p.77-78). The commando had to beat the parts with mallets and other instruments that "resembled the tools used when working with sand and stone". The Germans also ordered the Jews to reburn bones with the next batch of corpses, so we can assume that bones could be burned multiple times. Finally the Germans tried unsuccessfully to erase the ashes themselves using chemicals. Kues' review of Rajchman's memoir does not mention the ash commando. This must be a deliberate omission, intended to maintain a Straw Man about cremation times. The "ash commando" is also in Leleko, as referenced by Roberto (2.3). It seems to me that Arad's description (p.176) is based largely on Rajchman but does not credit him (the section is not footnoted).